Any time that you have trees on your property, you have a responsibility to make sure they look their best, are healthy and get properly maintained. Many homeowners give little consideration to the trees on their property and only take notice of them when some type of catastrophe befalls one of them, and it causes damage. If you take some precautionary and preventative steps each year, you can keep tree damage from ever being a worry to you. When you turn to us at Your Way Tree Service Inc. for professional tree trimming in Brentwood, we will do all we can to keep your trees healthy, looking their best and safe for your property. There are always several safety concerns when it comes to your trees. You want to look for overgrown limbs in several areas that can cause problems for you. Some trees may hang over sidewalks or pedestrian areas, and the limbs are so low now they cause a threat to those walking by. You may also have trees on your property where limbs have grown and are now encroaching on your power lines, setting up potential disaster should the trees strike the lines. Large, overgrown limbs can also hang too close to your rook or driveway, threatening the safety of your home, your family or your vehicles. While some people may think they can perform tree trimming in Brentwood on their own, it takes expertise and understanding to trim a tree the correct and safe way. Incorrect cuts on a tree can cause great damage to the health of the tree. You also can put yourself in harm’s way if you undertake a job like this without the proper knowledge or tools to do the job. You are much better off calling a professional service like ours to assist you, so you know the job gets done right the first time. When you call us at Your Way Tree Service Inc., you get the experience you want on the job to perform proper tree trimming in Brentwood for you. 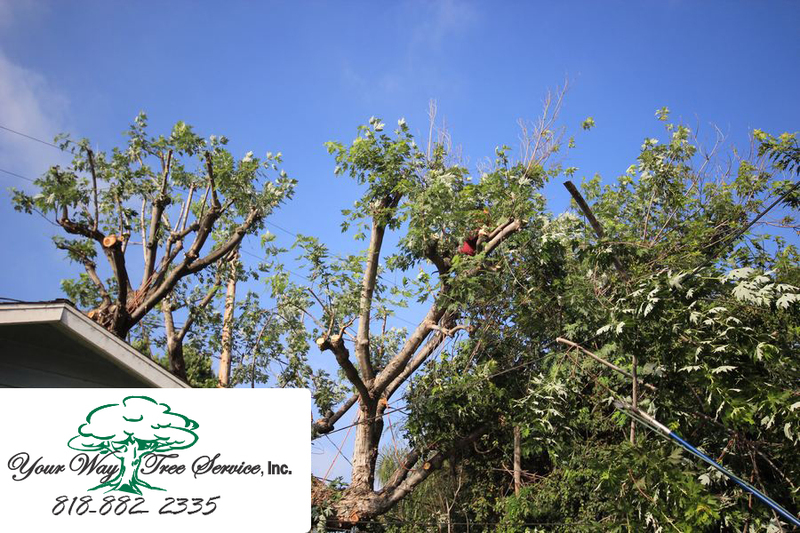 Our technicians are all highly trained and experienced so that they know the best and safest ways to trim your trees. You can contact us with questions or arrange for an appointment for tree trimming when you call our office at 818-882-2335 so you can be sure your trees are taken care of the best way possible.